Accessible showers; love them or hate him they are a fact of life if you can’t walk, but the good news – there are a lot of accessible showers to choose from. They vary on your mobility level, so you only have to install what you absolutely need. You can feel at our site the excitement of the game. All some people need is a simple shower bench (lucky ducks), and then you have the folks like me who need a roll-in shower AND a special “waterproof wheelchair” (aka shower chairs). Who knew taking a shower could be so complicated? When I moved, I was without a shower for over one month. Oh what a wait (thank god from my interim bathtub). Making the bathroom in my new place accessible shower-wise was a journey. Firstly, we decided to go the unique, lesser-taken route in the accessible shower world. Instead of doing a typical tiled roll-in shower, which can take weeks (and can cost a lot more), we installed a Corian custom roll-in shower from Innovative Solutions, a small company in Hastings, Minnesota. While this company isn’t known for making accessible showers (their main source of business is custom kitchen counter tops), they will create and install an accessible shower stall to fit any dimensions, which my dad (who’s a plumber) knew from word of mouth; really beautiful stuff that costs less than $3000, and we needed some lesser requested dimensions as well. Instead of the typical long and roomy roll-in shower, we went the less expensive route and decided to make the shower stall that was already in my bathroom accessible. This meant cutting out the floor, the walls, getting measurements and installing big pieces of Corian and a matching ramp. They also made sure the entire bottom of the shower was sloped towards the drain. All in all, it’s a pretty brilliant setup. I would totally recommend this to other wheelers. There’s one thing to keep in mind however – my version can get pretty wet despite this special drain. Let’s just say I’ve become an expert at towel placement outside of the shower stall. When you use a roll-in shower/shower chair combo to shower, you can usually guarantee the bathroom floor will always get soaked, but if you ask me a wet floor is a small price to pay for the blissfulness, not to mention cleanliness, a shower can bring. It may not be as roomy as the shower in my old place, but I don’t mind. I have one and that’s all that matters. 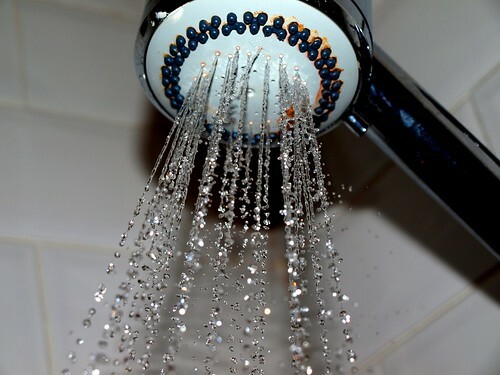 Nearly nothing can beat my 15 minute hot shower neck soaks. Roomy or tiny shower, it’s pure heaven. What unique ways have you made a shower accessible?